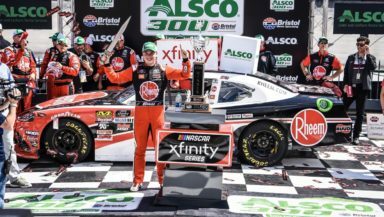 The NASCAR Xfinity Series Alsco 300 was held Saturday at Bristol Motor Speedway with not only bragging rights on the line. For four drivers there was also a whole lot of cash dangling like a carrot in front of them. The race was the first in the Xfinity Dash 4 Cash program which offers an extra $100,000 bonus for the top four finishers. Along with Bell, Tyler Reddick, Chase Briscoe and Michael Annett qualified for the Dash 4 Cash last week at Texas Motor Speedway, the opening round of the program. Christopher Bell driving his No. 20 Joe Gibbs Racing Toyota earned his first victory at Bristol along with the giant check that came with the win. This was his 10th Xfinity Series career win. Four of Bell’s wins have come on short tracks. Tyler Reddick in his No.2 Richard Childress Racing Chevy had a special paint scheme honoring Dolly Parton. Reddick wore a big blonde wig before the race in her honor. He pushed his car about as hard as he could but Bell was too fast for him. “I just needed a little more to get past Christopher,” Reddick stated, “ When I’m behind him it’s hard to make a pass. It was great to have Dolly Parton on our car today. It was a good day but it’s a shame we thought Stage 1 ended a lap too soon, we should have gotten that stage point,” Reddick chuckled. Stage 1 started with Cole Custer and Tyler Reddick on the front row. The first caution came out when the car of Jeff Green got loose and took Ross Chastain with him, and with both cars receiving heavy damage, they were both done for the day. Reddick had a miscue with his spotter, thinking the stage was over, and backed off, giving Justin Allgaier the Stage 1 win. Stage 2 started with Allgaier and Reddick on the front row. Allgaier kept the lead at the restart and led every lap in the stage. The only caution was for the spinning car of Jeremy Clements. The stage would end under caution giving the Stage 2 win to Allgaier. The final stage of the race started with Allgaier once again in the lead. Out of the blue, the No. 7 of Allgaier had problems and he took his car to the garage. Bell took the lead when Allgaier slowed on the track. The only caution of the stage was for Harrison Burton who slid sideways and slowed after cutting a tire down. Brandon Jones took a risk and stayed out when everyone else came to pit road, inheriting the lead. Several cars were fighting loose conditions and bounced off the wall including the No. 00 of Cole Custer in his Joe Gibbs Racing Toyota. Bell grabbed the lead when Jones fell back on older tires and never looked back winning the race along with the Dash 4 Cash money. Custer, in spite of fighting loose conditions, kept his car in the top five all day and came home in third place. Although he had a good finish Custer wasn’t very happy with his performance. Chase Briscoe and John Hunter Nemechek would round out the top five. Austin Cindric, Justin Haley, Michael Annett, Noah Gragson, and Harrison Burton finished sixth through 10th, respectively. The lap leaders for today’s race were Allgaier who led 138 laps, Reddick who led 61 laps, Custer leading 26 laps, Jones led 19 laps, and Bell led 57 laps. Reddick leads the Xfinity Series Standings with 321 points, Bell is second with 308 points, Custer is third with 275 points, Cindric is fourth with 251 points and Annett rounds out the top five with 238 points. The NASCAR Xfinity Series heads to Richmond International Raceway on Friday, April 12 where the top four finishers at Bristol – Bell, Reddick, Custer and Briscoe – will be eligible for the Dash 4 Cash.